Obedience to God’s commands comes from your heart. When you begin struggling to obey God, that is a clear indication that your heart has shifted away from Him. Some claim: “I love God, but I’m having difficulty obeying Him in certain areas of my life.” That is a spiritual impossibility. 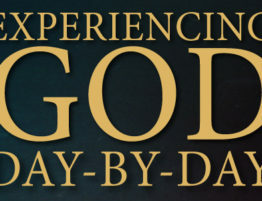 If I were to ask you, “Do you love God?” you might easily respond, “Yes!” However, if I were to ask you, “Are you obeying God?” would you answer yes as quickly? Yet I would be asking you the same question! Genuine love for God leads to wholehearted obedience. If you told your spouse that you loved her at certain times but that you struggled to love her at others, your relationship would be in jeopardy. Yet we assume that God is satisfied with occasional love or partial obedience. He is not. Obedience without love is legalism. Obedience for its own sake can be nothing more than perfectionism, which leads to pride. Many conscientious Christians seek to cultivate discipline in their lives to be more obedient to Christ. As helpful as spiritual disciplines can be, they never can replace your love for God. Love is the discipline. God looks beyond your godly habits, beyond your moral lifestyle, and beyond your church involvement and focuses His penetrating gaze upon your heart. Has your worship become empty and routine? Have you lost your motivation to read God’s Word? Are you experiencing spiritual lethargy? Is your prayer life reduced to a ritual? These are symptoms of a heart that has shifted away from God. Return to your first love. Love is the greatest motivation for a relationship with God and for serving Him.